The momentum of The Moon that Embraces the Sun is too strong, even though Wild Romance and Take Care of Us, Captain are sparing no efforts in catching up, but spirit is willing but the flesh is weak. According to AGB Nielson Media Research ratings agency’s statistics released on January 19th, 2012, the episode 5 of The Moon that Embraces the Sun broadcast on January 18th, 2012 achieved the rating of 24.9%, becoming the national champion. Because of excellent acting by the young actors, The Moon that Embraces the Sun which has its popularity surging is breaking its highest ratings record once again. In contrast, the ratings of Wild Romance and Take Care of Us, Captain are in critical state. The rating of Take Care of Us, Captain on January 18th is still acceptable 9.6%, but the 5.7% rating for Wild Romance is indeed far from satisfactory. 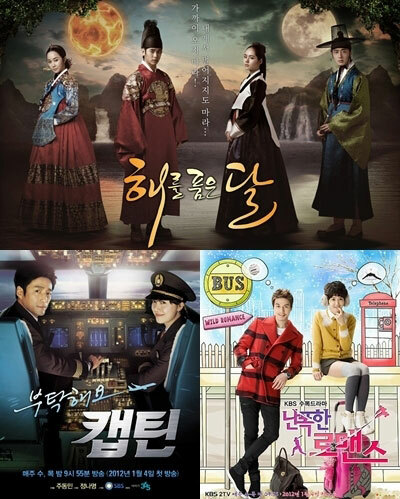 The battle of territory between MBC which is laughing because of popularity of The Moon that Embraces the Sun and KBS and SBS is increasingly heating up.